This Diamondback Terrapin was found roaming the shallows at Menunketesuck Island, a portion of Connecticut’s McKinney National Wildlife Refuge that lies just off-shore in Long Island Sound. Terrapins are particularly unique in their choice of environment. The world of turtles is generally divided between two categories: those that live in freshwater rivers and lakes, and those that live in the open ocean. Diamondback Terrapins, however, fall somewhere in the middle, almost exclusively inhabiting areas where fresh and saltwater come together to form brackish coastal marshes. The whole of Long Island Sound is an estuary which mirrors many qualities of coastal wetlands on a more extreme scale. Only a few miles from Menunketesuck Island, the Connecticut River dumps thousands of gallons of freshwater into the ocean every minute, turning the harbor into a brackish stew. Because the Sound is also sheltered from the rougher waters of the open ocean, the Diamondback Terrapin feels right at home. Heavy shoreline development in Connecticut has also caused major losses of the Terrapin’s preferred coastal marsh habitat. Undoubtedly, this has displaced many local populations of Diamondbacks, pushing them into areas where they might otherwise rarely be found. 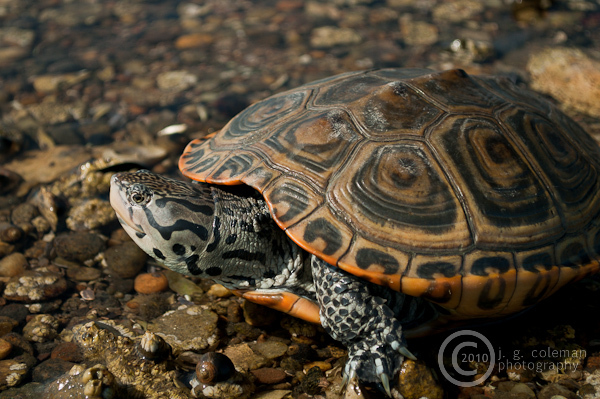 Photograph of the Diamondback Terrapin © 2011 J.G. Coleman Photography. View more photography by Trails of Freedom Chief Researcher, Justin Coleman, at J. G. Coleman Photography.